adidas and the fashion icon Pharrell Williams team up with Billionaire Boys Club to reimagine an iconic piece of modern footwear—the Stan Smith—in full-color, summer-ready palm-tree patterns. 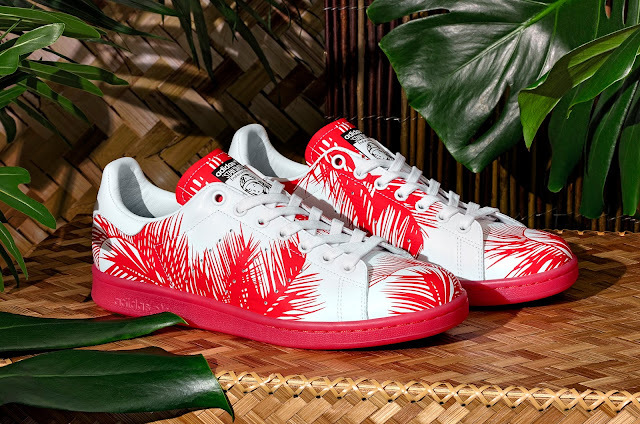 Combining the signature playfulness of Billionaire Boys Club with the personality of Pharrell, the Palm Tree pack is the first of its kind to feature an accompanying apparel element, allowing Stan Smith fans to rock a fresh, coordinated look all summer long. Over the past decade, Billionaire Boys Club has revolutionized streetwear. 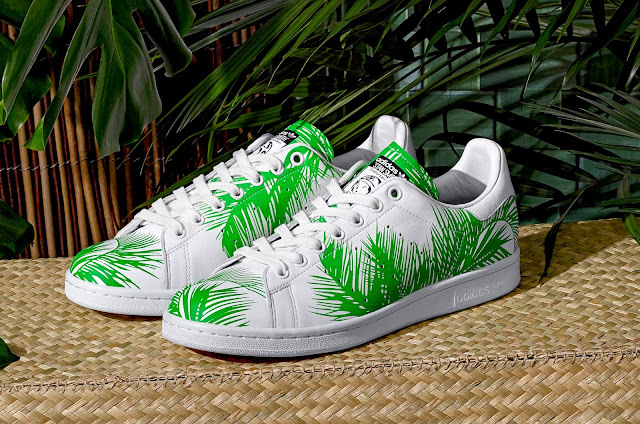 Last November, a first glimpse of the adidas x Billionaire Boys Club Stan Smiths caused a stir on the Internet, teasing a relaunch of the original diamond-and-dollar-sign motif. Now the collaboration is back and more fully fledged than ever, including a matching track top, T-shirt, tank, and shorts. Ever so slightly nostalgic, the reimagined Stan Smiths feature an all-over screenprint of a palm-tree pattern inspired by an early ICE CREAM shoe. The print, available in vivid green and orange-red, is emblazoned on soft Nappa leather. (Red pairs feature a color-coordinated frosted red midsole.) Each style comes complete with iconic Billionaire Boys Club branding, like the Astronaut tongue label and “B” logo on heel tab. The stylish sense of throwback cool is heightened with apparel printed in matching palm patterns. The track top is an easy summer zip-up jacket in green French terry with white palm prints and contrasting flocked black “B” logo. 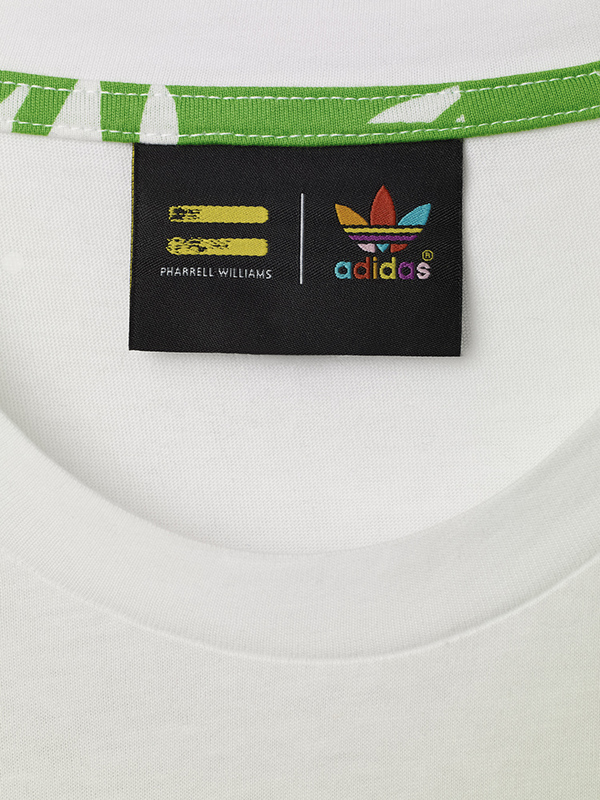 The cotton jersey tee incorporates the palm in subtler touches along its three-stripe motif and on its front patch pocket with embroidered black trefoil detail. 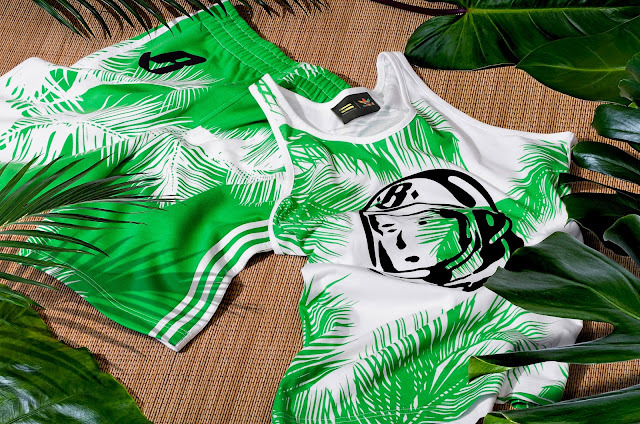 The singlet features a green all-over palm print on a white tank with the iconic Billionaire Boys Club astronaut logo front and center. Finally, the French terry shorts complete the look, offering an all-over white-on-green print with flocked “B” logo and embroidered trefoil motif. The adidas Originals = PHARRELL WILLIAMS Billionaire Boys Club Palm Tree pack is available from 10am on Saturday the 16th of July, 2016, at www.adidas.co.za.